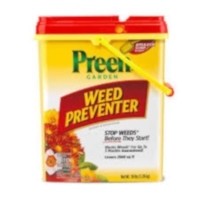 Preen Southern Weed Preventer is formulated specifically for tough southern weeds and warm climates. It inhibits most weeds from germinating for up to 4 months in flower beds, and around ground covers, trees, and shrubs. Although this product will not kill existing weeds, it will prevent new weeds from sprouting – eliminating the need for difficult and time-consuming hand weeding. Without weeds, your valuable plants can grow larger and stronger and your beds will stay neat and weed-free all season long!